The photographs of the Farm Security Administration (FSA) and its successor, the Office of War Information (OWI), which recorded American life in the late 1930s and early 1940s, remain among the most moving and famous documentary images from the first half of the 20th century. Yet, while the thousands and thousands of black and white photographs in the FSA/OWI's collection are well known, much less familiar are the some 1,600 colour pictures taken with newly available Kodachrome film. 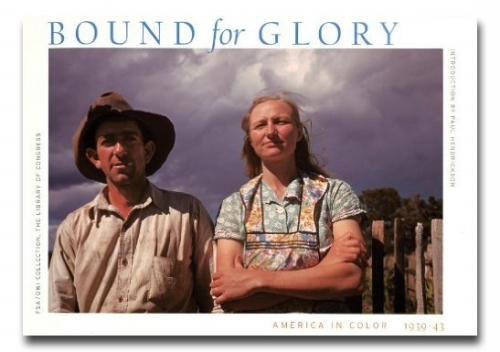 Now back in print, Bound for Glory is a selection of 175 of the best of these colour photographs, introduced by National Book Award finalist Paul Hendrickson and assembled to create a vivid portrait of America as it emerged from the Great Depression to fight World War II. Covering countryside and city, farm and factory, work and play, the images in this book--by the photographers Marion Post Wolcott, John Vachon, Jack Delano and Russell Lee, among others--open a window onto Americas experience from 1939 to 1943. Included are scenes and portraits capturing migrant labour, rural and small town life, industrial growth, women in the workforce, aircraft manufacturing, and wartime mobilisation. They reveal a world that we have always seen in our mind's eye exclusively in black and white. Never before has there been a book that paints this picture in full colour.